הפוך Close up of a Panda. מטבע זהב פנדה סיני משנת 2018 משקל 30 גרם Purchase your 30 g Chinese Panda gold coin from our store today for the lowest price online. 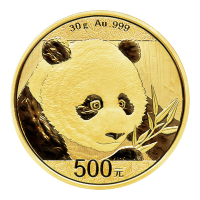 This gold coin is the latest release in the highly collectible Chinese Panda series, which has been minted every year since 1982, with anticipated design changes boasted on every release. The reverse of the coin features a close up depiction of the beloved Chinese Giant Panda, enjoying his staple fare of bamboo; this beloved species is considered to be one of China’s most important national treasures. Also on the reverse you’ll find the 30 g weight and purity stamp, with the weight having been changed to the metric system in 2016, to suit a more international audience; as well as the 500Yuan denominational value. On the obverse is a strikingly detailed depiction of the ‘Chinese Hall of Prayer for Abundant Harvests’ in Beijing, encircled by a wide frame. The legend reads, ‘The People’s Republic of China’ in Chinese characters and the year of issue, ‘2018’ appears below the image. Diversify your portfolio with China’s national treasure when you order your 30 g 2018 Chinese Panda gold coin today.